The Madikwe Game Reserve is home not only to the Big Five, but also to a wealth of other fascinating creatures, including the rare Wild Dog. 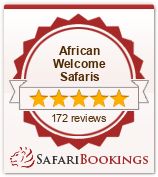 Our team at Madikwe Hills looks forward to showing you Africa’s wonderful wildlife and to fulfilling your every wish, making your stay the ultimate in privacy and luxury. The utter dedication and passion of the team at Madikwe Hills ensure that every guest departs with a memory of an African safari never to be forgotten. Madikwe Hills consists of a Main Lodge with ten suites, and a private camp, Little Madikwe Hills, accommodating twenty-four guests in total. At the Main Lodge, ten ultra-luxurious glass-fronted suites complete with their own deck and private plunge pools offer absolute privacy and majestic views.The unusual, yet subtle “Afrochic” décor integrates natural elements with colours highlighting Africa’s ambience, with each suite boasting soft sofas, voluptuous mosquito netting and cotton picot linen. Your suite has been designed for complete relaxation and comfort, with fireplaces and under-floor heating for the winter months, and for summer, overhead fans and air-conditioning, proving a welcome respite from the harshness of the African heat. Outside showers, romantic bathrooms and concertina glass doors allow you to truly feel at one with the environment. Separate from the Main Lodge is the ultimate in luxury and privacy, Little Madikwe Hills. Boasting a two bedroom suite with its own private landrover and game ranger, as well as a personal butler to take care of your every need. A gourmet kitchen and entertainment centre complete the picture. Two additional standard suites can also be reserved to form a completely private camp, which accommodates up to eight guests. Mouth watering cuisine is created by your personal chef in the gourmet kitchen of Little Madikwe Hills. You can even pick up a few culinary tips whilst you watch your meal being prepared! A luxury is being able to set your own meal and game drive times, making this the ideal exclusive family escape. All the sumptuous gourmet experiences are enjoyed in Little Madikwe’s beautifully decorated and enchanting dining room, and prepared in the state-of-the-art kitchen by a personal chef. A butler is on hand to respond to the group’s every need. A dedicated game ranger and game viewing vehicle means that Little Madikwe Hills’ guests can enjoy private game drives at their leisure, for as long or as short as they wish. Parents need not worry about their young ones disturbing the peace for other guests. Little Madikwe Hills’ reception room is also equipped with a satellite TV, and DVD collection. Little Madikwe Hills is ideal for families wanting to spend a special weekend together, and a permanent child minder is on hand for young family bookings. The Main Lodge does not accommodate children under the age of ten years. Most importantly the Madikwe Game Reserve is the ideal destination for families with young children, since the reserve is one of a few game-viewing areas in Southern Africa which is malaria free. The secluded environment and outstanding service is also an ideal retreat for corporate groups needing to get away and focus, whether with the objective of strategising, or simply spending time relaxing together as a team. There are internet and presentation facilities, and the outstanding yet discreet service ensures that corporates can stay focussed on the job at hand. Little Madikwe Hills is also available for private and exclusive weddings for guests of up to eight people. For more information, please contact reservations. Our main swimming pool offers a cool respite from the harsh African afternoon sun, and is a great way to relax with a cocktail! Dinners in our dining room are a silver-service experience of memorable proportions. Fine cuisine is accompanied by superb local and international wines, which can be found in our esteemed wine cellar next to the dining room. The cellar is a treat for the avid wine connoisseur as well as the learning amateur, and our staff will assist you by suggesting the perfect wine in accordance to the menu for that evening. Along with a warm and friendly atmosphere, Madikwe Hills offers you the highest standards of service and fine cuisine accompanied by superb wines from the wine cellar. Our unique boma offers the traditional and elegant atmosphere of dining under African stars. Our boma is used on warm summer and winter nights and is truly the ultimate way to experience Africa at its finest. On arrival at the boma, you will be welcomed by the Madikwe Hills team with a refreshing drink and an inviting snack, before heading for your beautifully created table to begin your meal. Your table is lit with candles and rustic hurricane lamps. Copper paraffin lamps truly complement the crackling fire in the centre of the boma. Starters are served at the table by your esteemed waiter, followed by a traditional fare of South African cuisine for your main course. You will be invited to sample various dishes from fish or game, to sautéed vegetables on the fire, all cooked before you with a truly African inspiration. End off the evening with a sumptuous dessert before bidding farewell to the flames of the fire for the calling of your suite. During the day, guests are welcome to wander up to the reception area to browse through our well-stocked curio shop, where you can select gifts and African memorabilia for your friends and family back home. The shop is stocked with an assortment of beautiful safari gear. Our winter gear and fleece scarves, hats and gloves are perfect for keeping the chills at bay on your evening game drives. On Morning Game drives, should you be feeling energetic, you may choose to experience an up close and personal glimpse of the African bush on foot with a gentle bush walk through the bush back to the Lodge. This experience provides exceptional close encounters with the smaller inhabitants of this wilderness.